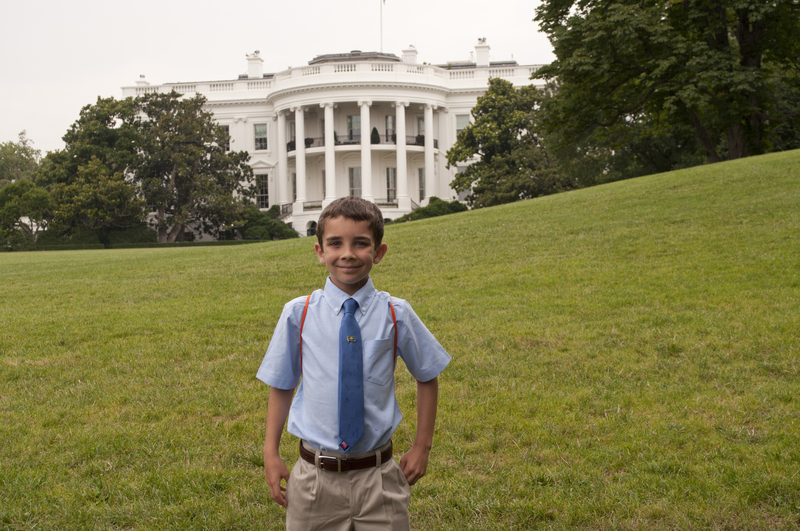 I know I need to update you about my trip to The White House but I have been very busy plus I have been tired. Everyone has been asking me what my favorite part of the trip was and I have had different answers to tell because at first my favorite part was the train ride. After the train my Mom and I rode on the Metrorail and that was fun, too, except you have to get on and off very quickly. Then I liked getting to the hotel. We stayed at the Westin in Alexandria. There was a big, white plush robe on one of the beds. We went with the other winners to the Smithsonian Museum of American History and saw a food exhibit. Tanya Steel, the lady who came up with the Healthy Lunchtime Challenge, says some of our recipes will be on display there in the Fall. Monday night we made toyrariums. They are these big pots of dirt with lots of different plants and we added toys to them. We added little dinosaurs, butterflies, insects, toadstools and stuff like that because the toyrariums are going to be donated to the Ronald McDonald House. After making the toyrariums we had a pizza party. The line was really long to get the pizza. I decided to sign the cookbook for Mrs. Obama first. I autographed a lot of cookbooks at the hotel. On Tuesday we woke up really early and ate a breakfast our of a red bag that said Health Lunchtime Challenge on it. Then we got on a big bus and headed to The White House. At The White House we had to wait a long time on the bus before we could get off of it. We saw a black dog sniffing around the bus and my Mom said the dog was making sure everything was safe. When we finally got to go in the White House we waited in a hallway for our turn to be announced. My Mom and I walked into a room and everyone was taking our picture and there were a lot of bright lights. I looked at my Mom and laughed. We went into another room and were given drinks that were flavored waters like pineapple. We were allowed to go through the red room, blue room and green room and take pictures. I took a lot of pictures with my own camera, but mostly my pictures are of other pictures. Haha. A man made all the kids balloon hats and animals. I was given a balloon hat that looked like a fruit bowl. We were given lunchboxes to decorate and jump ropes. I met Sam Kass while I was waiting in the lobby area near the drinks. 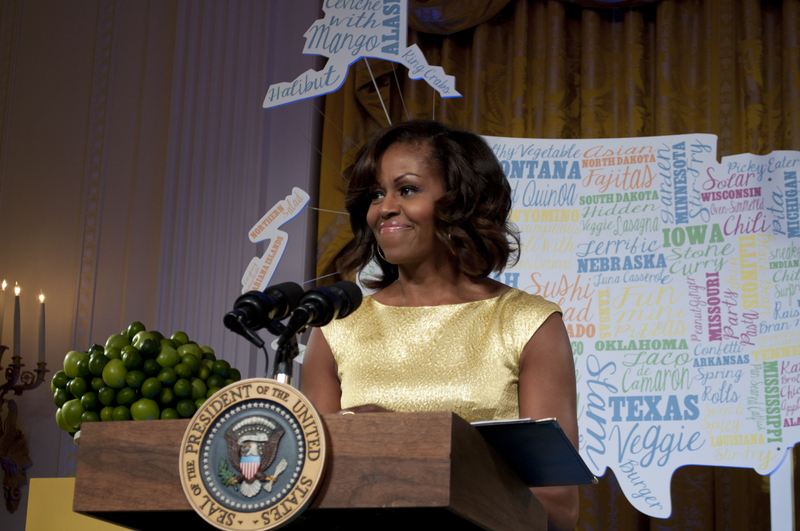 He is a White House chef and he advises the First Lady about Nutrition. We waited in line to meet the First Lady Michelle Obama. She gave me a hug and said she was happy I came to see her. Someone took our picture together and it is supposed to be mailed to me. 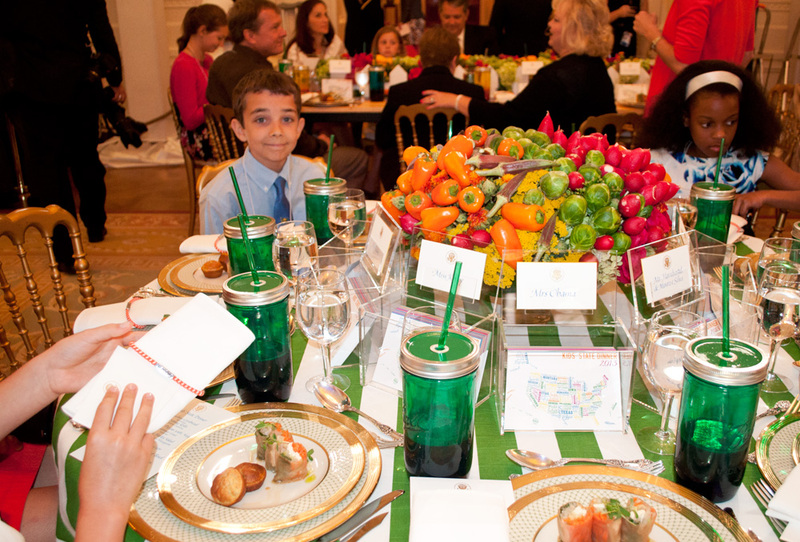 The dinner was very exciting but really it was lunch it was just called the Kids’ State Dinner because that’s a cool name. I thought that was going to be my favorite part but then I saw who was sitting at our table for lunch and it was Mrs. Obama. I couldn’t believe I was going to be eating lunch at the same table at the First Lady. And then my Mom showed me the name tag to my left and it was Tanya Steel. Wow! I talked to the First Lady about the Delaware Mud Run, Jr. She asked me a lot of questions. She could not believe that I ran up hills and jumped in the mud. I told her I raised over $1,300 for the Delaware Leukemia Research Foundation. She was impressed with me. And then a surprise person came and it was the President, Barack Obama. It was so cool! He even shook my hand and told me he was proud of me and thought he would like my Tortilla Bowl recipe. I tried a lot of new foods like spring rolls and zucchini muffins and cauliflower pizza. Surprising, I liked the muffins and the pizza but not as much the spring rolls. There were also banana muffins and I liked them, too. I can’t pick just one favorite moment, but if I had to it would be sitting at the table with the First Lady. She was very nice and she told us we could eat the food with our fingers. After the dinner we went back to the hotel. 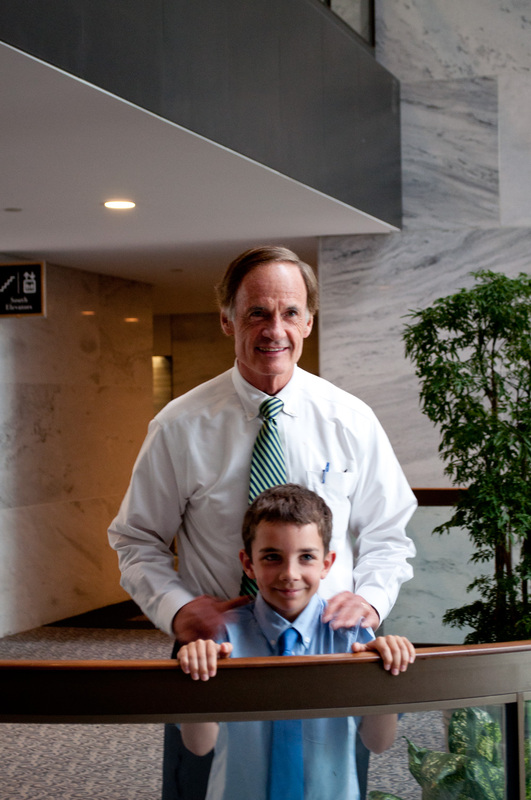 We ended up missing our appointment with Senator Carper, he is a Senator for Delaware. But my Mom was able to talk to his office and they understood we were at The White House and couldn’t just leave to go see him. He let us stop by before we got on our train to come home. He was very cool. I had my picture taken with him. He showed me his office and a lot of pictures of his family. I will write more when I can, I hope you liked hearing about the trip. And here is a link to download the Healthy Lunchtime Challenge 2013 Cookbook for free. Braeden, thanks so much for writing and sharing this–you will be happy to have it as time passes. I went to the White House last year with my daughter, Arla, who was the Healthy Lunch Competition winner from Washington State. Reading your post brought back so many great memories for me. 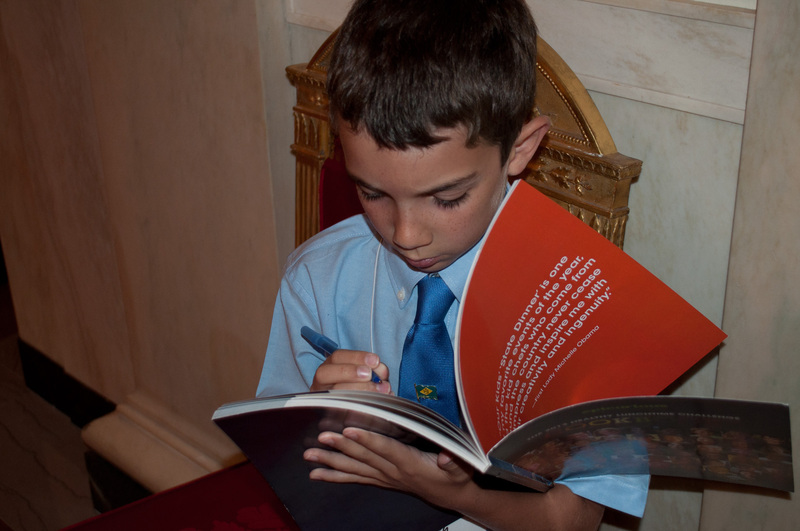 Some things were the same (autographing the books, visiting the Smithsonian, plush robes in the hotel, walking into the press room with so many cameras!) and some were different (making Toyrariums, decorating lunch boxes). 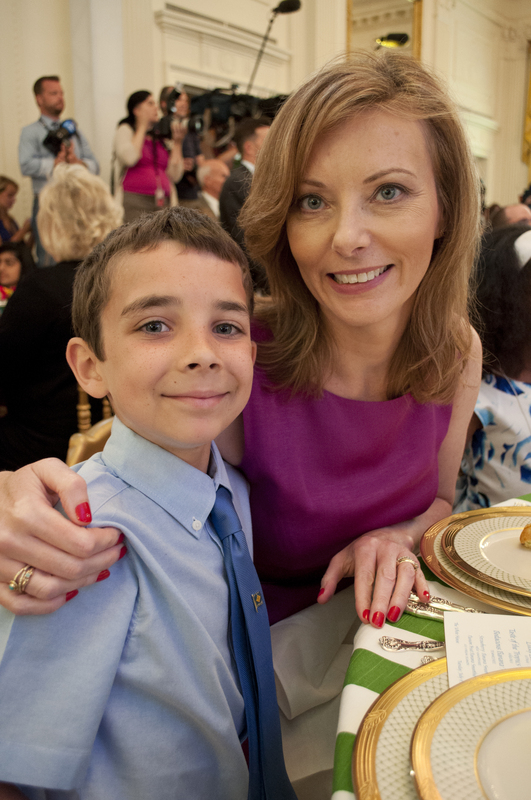 It is such a special experience–especially for you to sit with Mrs. Obama and Tanya Steel. Congratulations and thanks again for sharing! PS Your grandpop is right, you are a very good writer. Keep it up! Thank you very much. I am going to write about my recipe soon too. And I am happy Aria and you had a fun time too. I really loved reading this, good job…What a wonderful experience for you and something you will remember for the rest of your life…Can’t wait to try your recipe at the beach, so excited…..Keep writing and we’ll keep reading.. Love you !